It was a hot time in downtown Portland today, with a high around 95. Felt almost like home! I flew into town around noon, grabbed a Saturn rental car, and survived the I-405 traffic jam to arrive downtown for lunch. I had to have seafood, of course, so I went to Jake’s Famous Crawfish, established 1942. Pricey but tasty Alaskan halibut fish ‘n chips put me in the PCNW mood. I walked over to Courthouse Square, where they were having their annual Sand in the City fundraiser for a children’s charity. 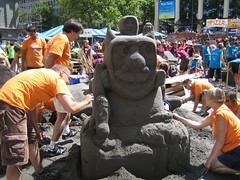 They hauled in tons of sand today and teams scrambled to sculpt it by 5 pm. Then I strode down to the Portland Art Museum to take in the M.C. Escher exhibit. It was fun to see in person not only some of his prints, but the study drawings and even a couple of cancelled wood blocks he used. The museum was a nice chance to cool off – a guard told me he was from Washington State and his hometown never saw temperatures above 65, so he was melting today. I told him that after triple-digits in Oklahoma recently I felt right at home, sweating my way around Portland. I strode around downtown, taking in various sculptures and fountains. It was fun to see a number of families with children enjoying the huge Ira Keller Fountain, which reminds me somewhat of that water thing in Fort Worth, TX they used in the movie Logan’s Run. By 5:30 pm Pacific Daylight I’d been up for over 14 hours and was tiring out. So I clambered up to my car, baking on the seventh floor roof of a city parking garage, and hauled over to the Motel 6. Wouldn’t you know, they didn’t have the air conditioning on in the room? So after a quick shower I fled to a nearby restaurant recommended in the AAA Tourbook. The food at Chez Jose’ East was good, but the restaurant wasn’t air conditioned, so it was also hot! Returned to the motel, where the air conditioning was catching up, and used the free WiFi to upload the photos and movies to Flickr so you could see the slideshow. I also posted to Brightkite throughout the day. Don’t know if I’ll have time to post blog entries each day or not – we shall see. Tomorrow morning I plan to see the Japanese Garden in Washington Park and then drive over to Saddle Mountain for a comfortable afternoon day hike, since the forecast high there is in the 70s. I get to try out my new hiking shoes and trekking poles. Then I drive over to Seaside for the night.